Philo T. Farnsworth, one of the pioneers of electronic television, invented a special type of electron tube for use as a camera tube or imaging tube in television systems. 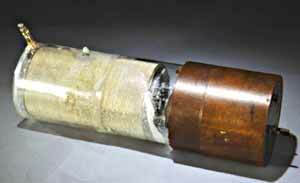 This tube, for which he filed a patent in 1927, was called the Image Dissector. To understand how an Image Dissector works, it is best to simplify the concept. In the simplification, the image dissector “sees” the outside world through a glass lens, which focused an image through the clear glass wall of the tube onto a special plate, which was coated with a layer of cesium oxide. When light strikes cesium oxide, it emits electrons, so you could think of the special plate like a mirror that “reflects” an image made of electrons, rather than light. This invisible electron “reflection” was aimed at a small detector circuit, which captured the electrons so that they could be amplified and transmitted to a television receiver. This page was last edited on 10 April 2019, at 14:06.